Wham BAM! I looked up at my calendar this morning and realized that Valentines Day is like 2.5 seconds away. Our tradition has always been to skip the overcrowded restaurants and set menus, and stay home on the actual day. The Husband loves to cook and it’s one of the only times during the year that I will let him completely destroy the kitchen all in the name of love. And of course, as a gesture of my profound gratitude for our meal (usually Osborne Family spaghetti) I must of course give him a token of my love and affection. SO, here are a few things that are in the running for his Valentines’ Day gift. Nothing says love like a cozy cashmere sweater. Last week I popped over to a friends house and made a comment about her snuggly “jumper.” Turns out it was her Husband’s Christmas present. Moral of the story? Buy it for him and then steal it. Thank GOD someone ha created chic looking man headphones, because I for one am sick and tired of looking at the Dr Dre ones. These Master & Dynamic ones have a vintage feel which I am totally loving. I don’t know about you, but I have a Husband who is quite frequently absent. Early morning packing for business trips makes no one happy when certain men are fumbling in the bathroom trying to get their favorite soap packed. This shower kit can easily be thrown into a suitcase at a moment’s notice and therefore, makes everyone happy. Mini AB has developed an obsession with superheroes, so I suppose this is a gift for him too. If you have to have comics lying around the house, then this is your best option. Perfect for his home office or mancave. Because YOU want HIM to smell nice, and you want your bathroom counter to look pretty. Simple as that. I also think that Husband and I are in a perfume and cologne rut, so experimenting with some new scents is definitely in the cards. Love a man with a good cuff-link collection. These are super duper chic and can go to the office everyday or a black tie ball at night. Boys don’t have a lot of opportunity to create a pop of color in their wardrobe. Ties and socks are pretty much the only option when it comes to weekday self-expression. Out with the boring black wallet and in with this blue textured number. 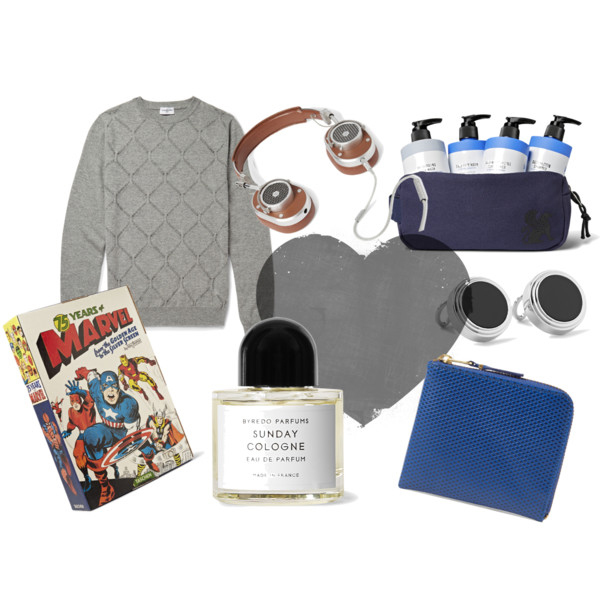 All gifts available at Mr Porter.